Masato Shiono knows exactly what a modern defender needs: A blade which allows you to feel the ball. A blade that guarantees consistency for a controlled defensive game but which has the speed for a surprise attack. This is the Shiono Def in a nutshell. First of all it looks good, and making a racket is polite and there is quite a sense of luxury. I think that the grip is narrow and likes and dislikes will be separated, but I think that it is easy to use if you get used to it. I feel that it is an excellent racket to put out not only cuts but also Tsutsuki (bench) even with a burned turn. 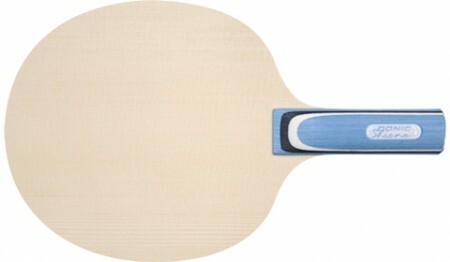 I think that it is a racket that seems to be Shiono because it is easy to shake quickly and compactly. · The grip was distinctive and seemed to slide unintentionally at first, but when I got used I gripped naturally deeply. - Because it is small in the cutting racket in terms of performance, it was able to cut with a quick swing. · Although the price is a bit high, it is easy to spin and it was reasonable momentum, so it is recommended. Face is a bit small, but cut there is stability with sharpness. Is about a little raise the momentum of Def play Senzo. Attack There are also quite easy response. But it is worth it is high price used in the fact that a little model.